I’m often asked what the most important metric is in investing. My answer is simple: Time. Time is the most important commodity in the world. And in investing, it can make the seemingly impossible possible. The more time you have to invest, the better off you are. You can rebuild from market disasters or even your own costly mistakes. Because of that, I push everyone to start investing as early as possible. I know in the beginning it seems small and insignificant... almost embarrassing. But remember, time can take a small stake and grow it into a mountain of wealth. If you start investing at 20 years old, you need to tuck away a mere $2 per day to become a millionaire by 65 - $2.00! That’s it... a mere $730 per year. Over the past five years, small caps on the Russell 2000 averaged more than 14% annually, while Russell 2000 growth stocks averaged more than 15% annual returns. People make thousands of excuses for why they don’t invest. Often, people delay investing, thinking they’ll have more money down the road. Surveys show 53% of people who don’t own stocks say it’s because they can’t afford to. But that’s a trap. The longer you put it off, the worse it becomes. The current median annual salary for Americans 20 to 24 years old is $29,952. That’s $576 per week. 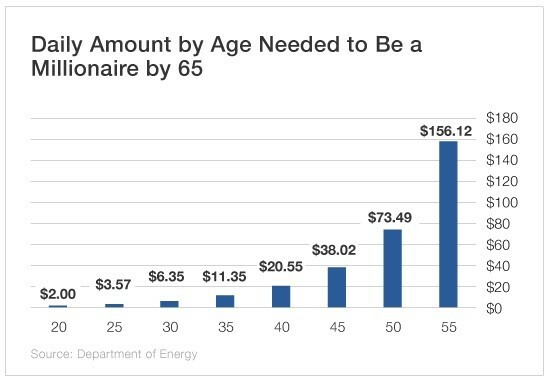 That means an individual in this age bracket would need to put away less than 2.5% of their annual salary each year to become a millionaire by age 65. And that percentage shrinks over time as their salary increases. But as more time slips away, the more difficult investing becomes. Let’s say you’re 55 years old. To become a millionaire by 65, you’d have to save and invest $156.12 per day. The median annual salary for Americans 55 to 64 years old is $50,440 per year, or $970 per week. More than 100% of an individual’s salary would have to be invested every single year. Looking at the chart, the amount needed to be saved per day between ages 20 and 25 increases 78.5%. The amount needed to be saved per day between ages 20 and 55 increases 7,706%! The tragedy is that 57% of Americans have less than $1,000 saved. And even more shocking is 39% have no money in savings. On top of that, around half of all Americans have no retirement savings at all. That’s why every time I hear someone say, “I’ll start investing in a couple years when I have more money,” I tell them they’re hurting only themselves. The longer you wait and waste that time, the more expensive it becomes. But if you start with the right mindset and understand the importance of time, you can easily find yourself well ahead of the game. 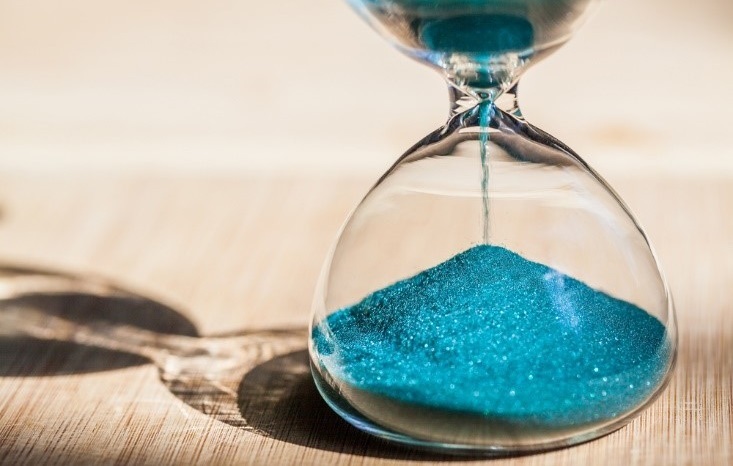 Matthew talked above about the value of time when it comes to investing over your lifetime - the earlier you start, the less you have to set aside annually in order to end up a millionaire. Of course, there are those who think they can make up for lost time by romancing Lady Luck at the slot machines in Vegas. Golden Entertainment (Nasdaq: GDEN) operates 16,000 gaming devices, 114 table games and more than 5,100 hotel rooms. It may not be a household name like some of the big names that dominate the Strip. But in Nevada, its video gaming machines are in used in 1,000 locations. In fact, it's the largest distributed gaming operator in the state, the second-largest in Montana and a licensed operator in Illinois. And there are opportunities for it to expand this business into Oregon, South Dakota, Louisiana and West Virginia. But that's not all. Golden owns eight casinos in Nevada as well as one in Maryland. On top of that, it operates almost 60 traditional taverns in Nevada. At the end of October, Golden completed an $850 million acquisition of American Casino & Entertainment Properties. This added three properties in Las Vegas to Golden's portfolio - the Stratosphere, Arizona Charlie's Decatur and Arizona Charlie's Boulder. And it also added the Aquarius Casino Resort in Laughlin, Nevada. This continues Golden Entertainment's goal to be a leading Nevada-focused operator. What's also important is that there's synergies already underway because of this acquisition. In the fourth quarter, Golden saw increasing numbers of its tavern patrons visit the Stratosphere and the two Arizona Charlie's locations. And in 2018, the gaming company has budgeted $32 million to renovate the Stratosphere to attract even more business. The Stratosphere is at the north end of the Strip, and several large-scale projects are underway to drive more traffic there. So the deal is already paying dividends. The company's revenue grew even when the acquisition of American Casino wasn't included. So it saw organic growth as well as acquisition-fueled growth. Industrywide, casino revenue on the Strip saw a slight decline in the fourth quarter. But this is a short-term blip caused by expansion work. Golden already said it has seen numbers normalize in February and March. And the gaming operator isn't focused on just the Strip. In Laughlin and North Las Vegas - both areas where Golden has a footprint - casino revenue is surging double digits. In the fourth quarter, net revenue for Golden Entertainment rose 74.9%. For 2017, revenue rose 26.4% to $509.8 million. In the first quarter, revenue is projected to increase 103.6% to $217.22 million. And then it is expected to jump 103.7% in the second quarter to $225.09 million. Shares of Golden Entertainment are more than 27% below their 52-week high of $34.75.